Currently viewing the tag: "nyc card"
Catch me in Chelsea Market! 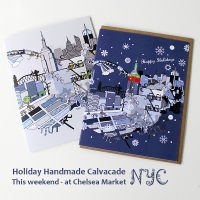 I’ll be in Chelsea Market this weekend for the Holiday Handmade Calvacade! 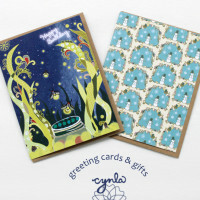 Come visit my booth – I’ll have a ton of these NYC cards. New York City by day and by holiday. Oh New York, New York. Love you in all seasons. Beautiful during Christmas time with the tree, the Empire State all lit up, holiday events and shopping, and snow that melts in 2 seconds on those busy streets.